Water firm United Utilities has been fined £300,000 after supplying water unfit for human consumption to 700,000 customers. 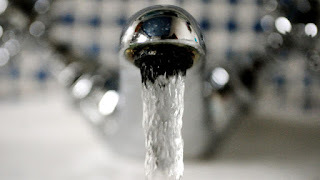 United Utilities has so far paid out £25m voluntarily in the form of compensation to householders and businesses affected, providing one million bottles of drinking water at the time of the contamination and donations to charity. Preston Crown Court heard that the contamination happened because the parasite found its way into a service reservoir holding treated water that had structural defects. There was no outbreak of cryptosporidium disease as a result of the contamination - with the judge accepting there was no evidence to suggest the contaminated water caused people to fall ill. He said: "It was the largest event of its kind since the privatisation of the water industry many years ago and it had a major impact on day to day water consumption. "There was significant disruption to domestic consumers but also to businesses as well." United Utilities' chief executive Steve Mogford said the firm was "very sorry for the impact this has had on our customers". "I know from first-hand the inconvenience this incident caused, having lived in Lancashire for 40 years. "We have learned valuable lessons from what happened and have put technology and processes in place to guard against a repeat of this type of incident."